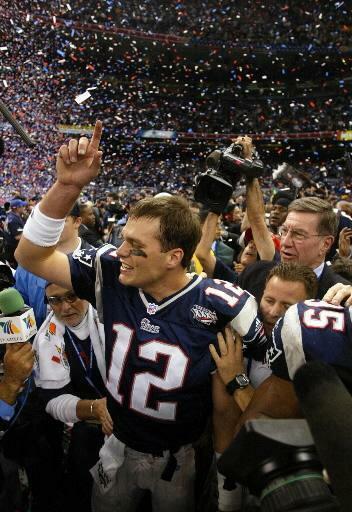 Tom Brady led the Patriots to a win in Super Bowl XXXVI. NEW ORLEANS - ‘’The Impossible Dream’’ has a new meaning in Boston sports lore. Maligned, disrespected, and disbelieved, the New England Patriots won Super Bowl XXXVI last night, 20-17, over the highly favored St. Louis Rams at the Superdome. And, not surprisingly, they did it on the final play of the game. Adam Vinatieri settled the score with a 48-yard field goal as time expired, sealing one of the biggest upsets in NFL history and completing one of the all-time worst-to-first stories. ’’We shocked the world,’’ summed up veteran cornerback Otis Smith. It was the latest in a succession of games that cast the Patriots as the underdog, but once again they outcoached, outmashed, and outwilled the opposition. It did not matter that they were playing a team with the fastest players in football and one of the greatest offenses in NFL history. The Rams were unable to use their speed because they found themselves on the turf, face-down, so often. And in terms of intangibles such as will, desire, and heart, the Patriots were through the roof. The players hugged and kissed in jubilation on the Superdome turf, celebrating the first league championship since the organization’s inception in 1960. It took Bill Belichick just two years to win the championship, which comes a year after his team finished in last place in the AFC East with a 5-11 record. Young Tom Brady (16 of 27, 145 yards, one TD, no interceptions) calmly directed the Patriots to the winning score after the Rams had tied the game, 17-17, with 1:30 remaining. With short passes of 5, 8, and 11 yards to J.R Redmond, plus key completions to Troy Brown and Jermaine Wiggins, Brady directed the no-huddle offense with no timeouts. He took the Patriots from their 17-yard line to the Rams’ 30, setting up Vinatieri with 7 seconds left. A clutch kick was nothing new for Vinatieri, who nailed a 45-yarder in a snowstorm to set up an overtime victory over the Oakland Raiders in these playoffs. He won three games - including the one against Oakland - with overtime field goals this season. Vinatieri’s heroics came after the Rams rallied behind league MVP Kurt Warner to tie the game with two fourth-quarter touchdowns after falling behind, 17-3. All of the Patriots’ scoring to that point was set up by turnovers. New England picked off two passes - one of which was returned 47 yards for a touchdown by Ty Law - and recovered one of the Rams’ two fumbles. The Rams had no takeaways. When the Patriots got the ball back with 1:21 left, Weis and Belichick had a short conversation and decided to go for the win rather than take their chances in overtime. After the Patriots built a 14-3 halftime lead - on Law’s return and an 8-yard TD pass to David Patten - the Rams appeared to be getting into a rhythm midway through the third quarter. But Otis Smith picked off a Warner pass after Torry Holt fell down, setting up a 37-yard field goal by Vinatieri that made it 17-3. On their first drive of the fourth quarter, the Rams moved to a fourth-and-goal from the 3, when Warner made a dash for the end zone himself. A jarring hit by Roman Phifer knocked the ball loose at the 2, and Tebucky Jones grabbed it and bolted all the way for an apparent touchdown return. But Willie McGinest was called for holding Marshall Faulk, and the Rams were given the ball on the 1, first and goal. Two plays later, Warner took it in for his team’s first touchdown. The Patriots went from having a 24-3 lead to having a 17-10 lead. The Rams appeared fired up. Their defense smothered the Patriots on the next series. Defensive end Leonard Little, who hadn’t been heard from often, hurried Brady into a bad throw on third and 2. Brady, who had played mistake-free and looked poised for much of the game, looked frazzled on that series. After a Ken Walter punt pinned the Rams deep in their own territory, McGinest soon redeemed himself with about 4 minutes to go when he sacked Warner for a 16-yard loss after the Rams had driven to the Patriots’ 39. Warner threw incomplete to Holt on third down, and the Rams chose to punt instead of going for it with less than four minutes to go. ’’It felt good because it took them out of field goal range,’’ said McGinest. But the Rams defense held again, and Warner got the ball back with 1:51 to go. It took him just three plays to tie it, hitting Proehl with a 26-yard scoring pass. But St. Louis left enough time for Brady and Vinatieri to work their magic. The Patriots’ stunning 14-3 lead at halftime came despite a sluggish offensive performance. The Rams scored the only points of the first quarter - a 50-yard Jeff Wilkins field goal - as the Patriots looked for a big play or a big mistake. They got both in the second quarter, courtesy of their defense. Warner dropped back to throw with 8:49 remaining in the half, but all he saw was linebacker Mike Vrabel closing in. Vrabel had faked substitute right tackle Rod Jones, who was playing with a strained right groin, and managed to hit Warner as he released the ball. The pass, intended for Isaac Bruce, went instead to Law, who ran unimpeded 47 yards to give the Patriots a 7-3 lead. With less than two minutes left, Warner completed a slant to Proehl, but Antwan Harris knocked the ball loose with a nice hit as Proehl was falling to the turf. Terrell Buckley chased the ball down and returned it to the Rams 40. The Patriots offense clicked just in time. Brady hit Brown on an inside route for 16 yards to the 24, connected with Wiggins for 8, and pitched to Kevin Faulk for 8 more down the left sideline. On first and goal from the 8, Brady tossed a soft pass over Dexter McCleon’s reach into the hands of Patten, who made a circus catch as he trumbled in the corner of the end zone. The Patriots walked off with the shocking 14-3 halftime lead, and the Rams never really recovered. And that is why they now have dibs on the ‘’Impossible Dream’’ label.